Lotus Hotel is officially opened on August 1, 2003. 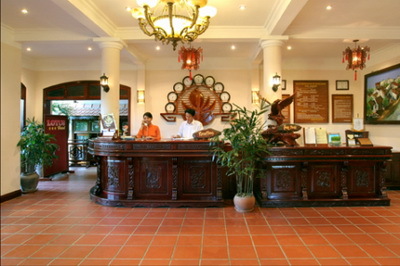 Our hotel is within easy access to all the shopping areas & dinning places in Hoian Ancient Town. Lotus Hotel consists of 06 separate buildings with 65 guest rooms. The Lotus Hotel is close to Cua Dai beach and just a short trip into the Hoian Old Town - a UNESCO World Heritage Site Lotus Hotel features 65 comfortable rooms including 02 Suites, all with private balcony overlooking the beautiful gardens, free-form swimming pool or surrounding countryside. Our beautifully designed resort-hotel draws from a range of styles & influences resulting in a perfect blend of Eastern culture & French architecture, while our rooms are immaculately furnished and equipped in a relaxing combination of Traditional Vietnamese and French styles. Our professional and friendly staff is always at hand to offer helpful advice on local sightseeing & tours throughout the area. Our first class facilities ensure Hoian Lotus Hotel is the perfect place to enjoy a relaxing holiday, a business break or romantic gateway.